Picture on left is from Bessie and Frank's collection. Picture on right was taken in 2000. In the fall of 1928, Dr. Frank and Bessie Beck returned to Bolivia to begin the medical work. Bessie writes, "We went through an unlocked gate from the school grounds to the front of the old clinic. In the parking area of the clinic there was a beautiful landscape view of Mt. Illimani." This view is now blocked by the high rise buildings. 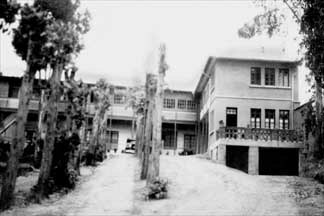 Their first clinic was located just uphill and on the property of the American Institute. 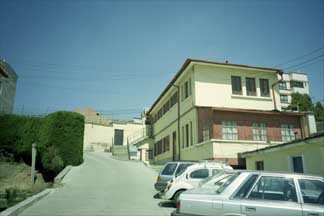 They operated a medical clinic here until l939, when the building of Hospital Metodista was completed. Bessie wrote, "In the old locale next to the American Institute he began with three beds, a pressure cooker for a sterilizer, and a kit of instruments bought as World War I surplus. Our hospital property adjoined that of the school, with no gates in between on Landaeta Street. "Bessie states, "we were not able to secure additional land so that we could have an outlet for the hospital, which would be independent of the school, as patients came day and night and it was not convenient for the school to have them going through their grounds. So we decided to move to Obrajes, 1000 feet below the city, in a beautiful suburb of the city."